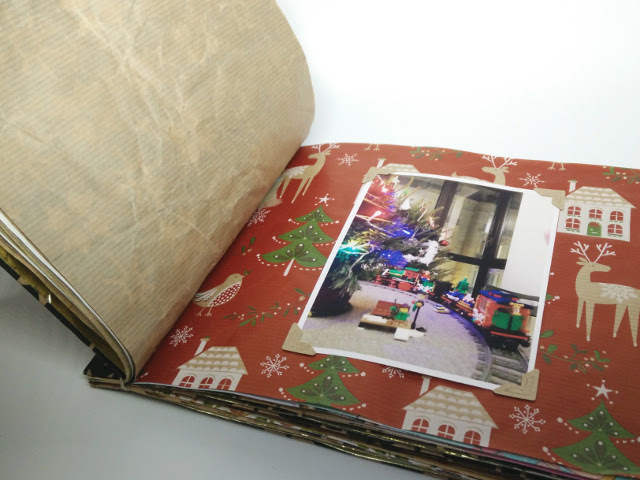 This Christmas photo album made from recycled wrapping paper is the perfect craft project for just after the holiday season. 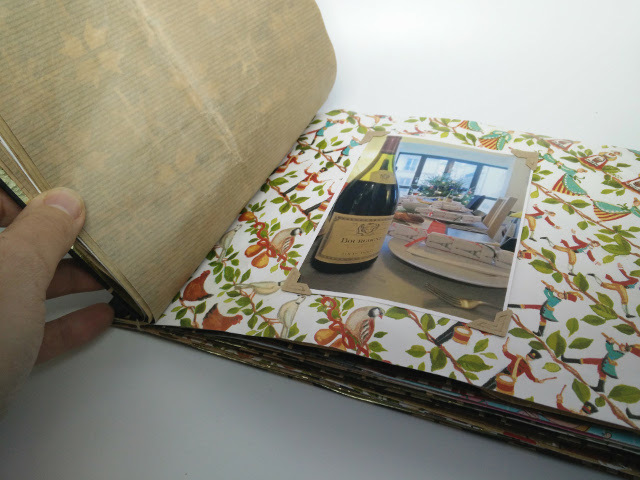 Recycle any left-over wrapping paper into a book to keep photos, sketches, or other mementos. This project is based on the same technique used to make these recycled notebooks made from recycled printer paper. You can download the instruction sheet here. 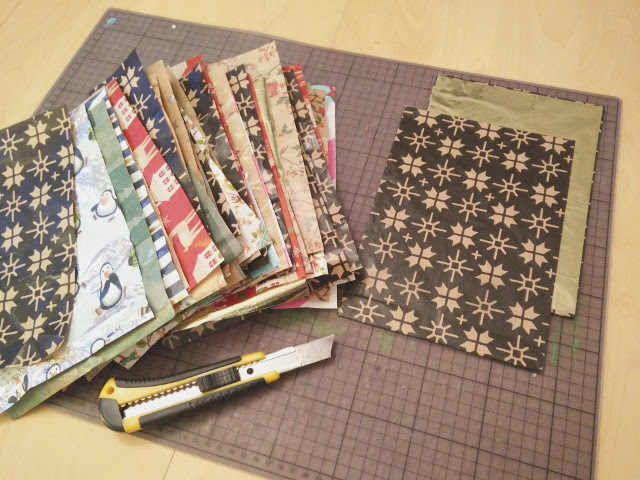 The only difference is that I used recycled wrapping paper to both decorate the cover, and for the pages of the book. 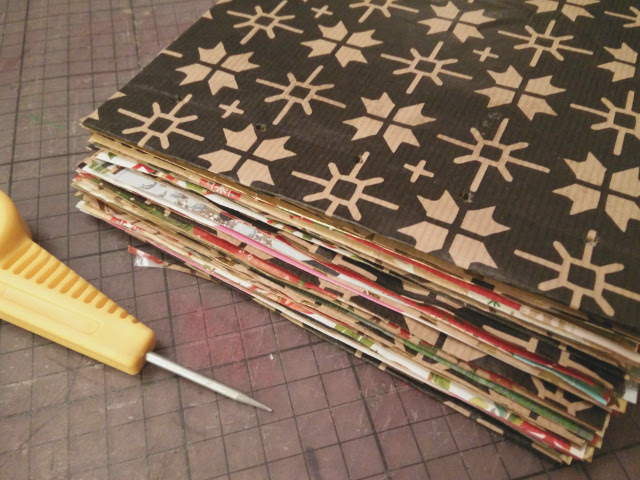 Cut two covers from recycled cardboard to the size you want your finished book to be. I made a landscape book, of 24 x 17cm. To make it easier to pierce the holes, you can cut a small slit in the cover at the place where you will pierce the holes later for the binding. I cut a slit of a few millimetres, about 2cm in from the edge. 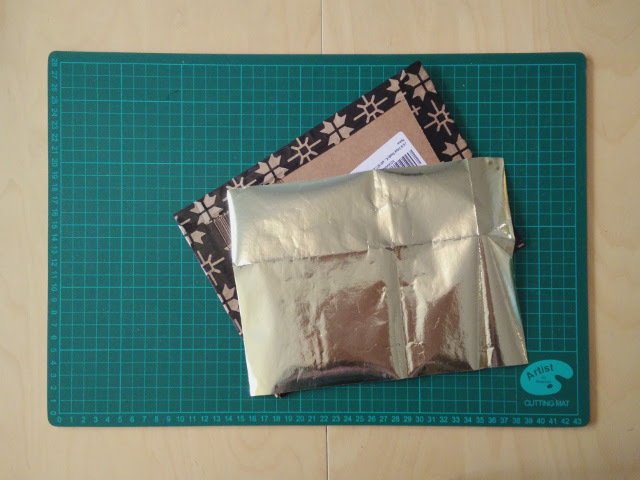 Choose a nice piece of recycled wrapping paper and glue this to your cardboard cover. Spray glue works best for this part. 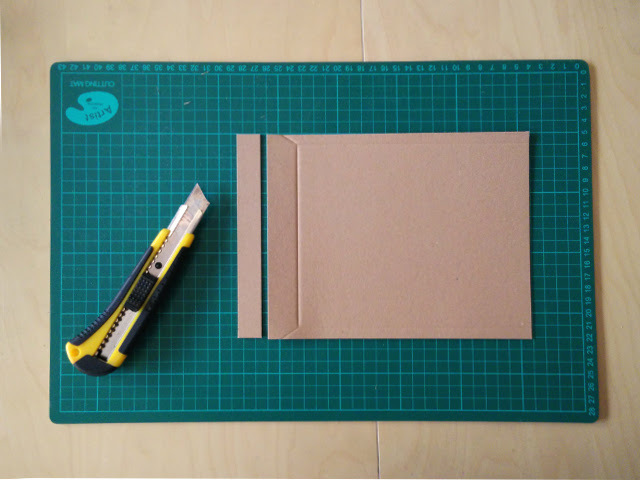 Glue the two parts of your card to the paper, leaving the gap between them that allows your final cover to still be of the correct size (24 x 17cm). The idea is that the wrapping paper with cover this gap in the card, but when you pierce the holes later you won’t have to pierce the card too. 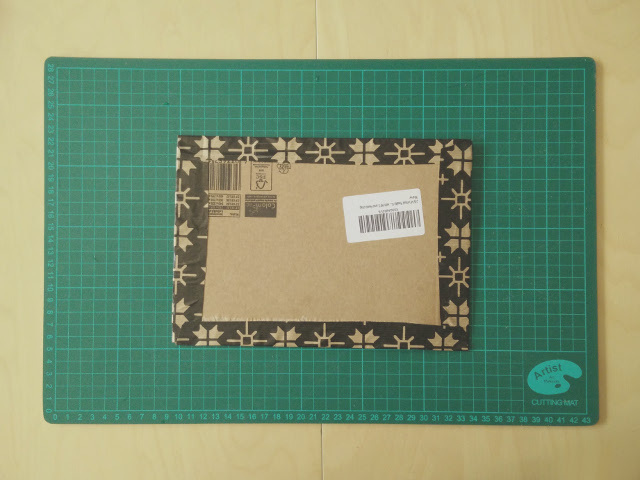 Cut the paper leaving a flap of a few centimetres around each edge of the cardboard. 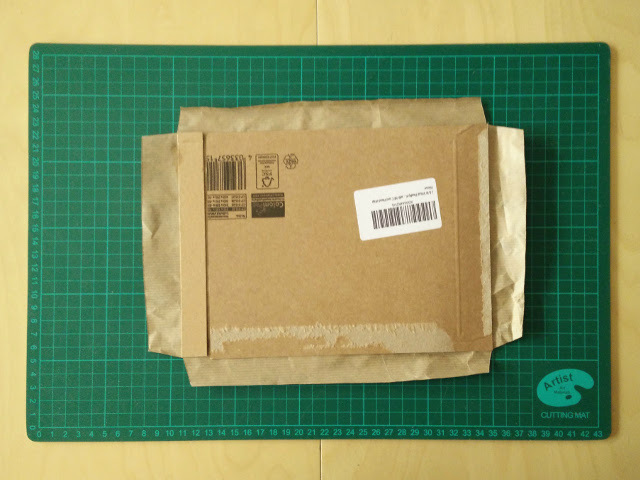 Glue these flaps of paper around the cardboard. 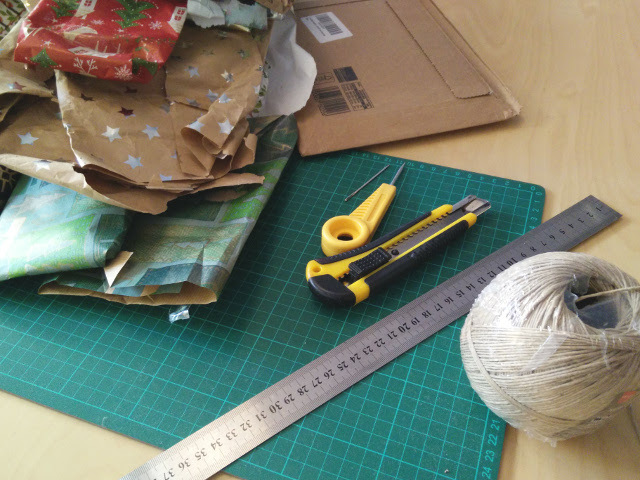 Then cut a piece of wrapping paper a little smaller than your final page size to decorate the inside of the cover. 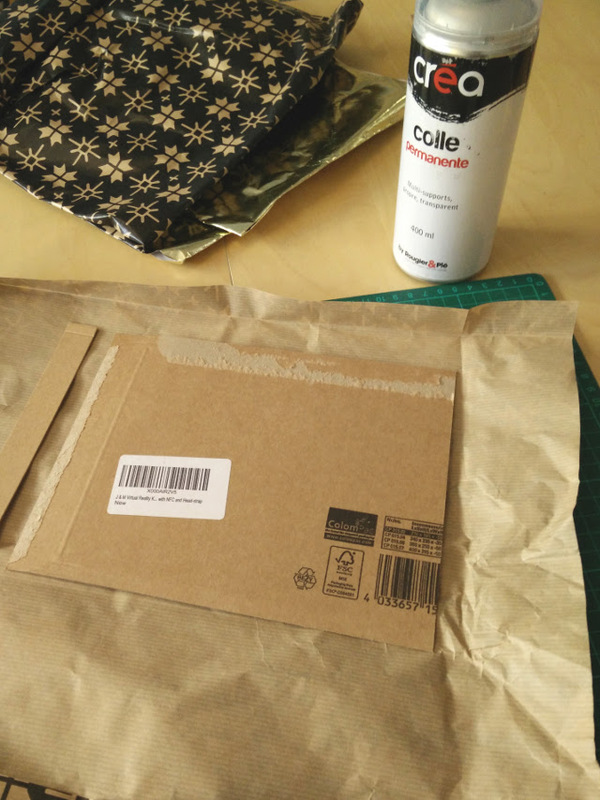 Glue this paper, again using spray glue, if possible, to prevent the paper from warping. Cover the second cardboard cover in the same way. 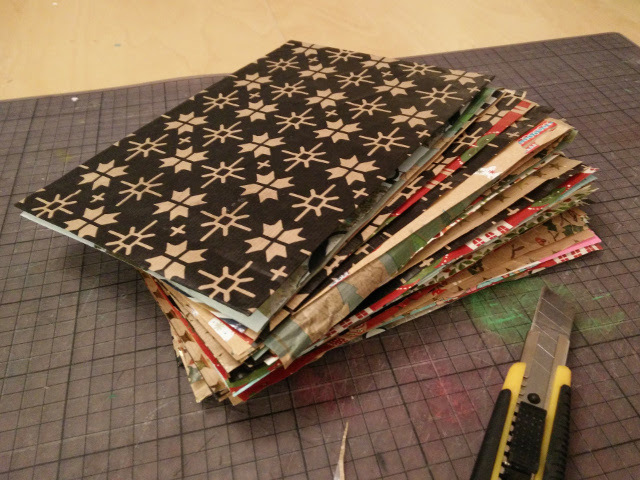 Cut as many pages as you want out of different recycled wrapping paper. 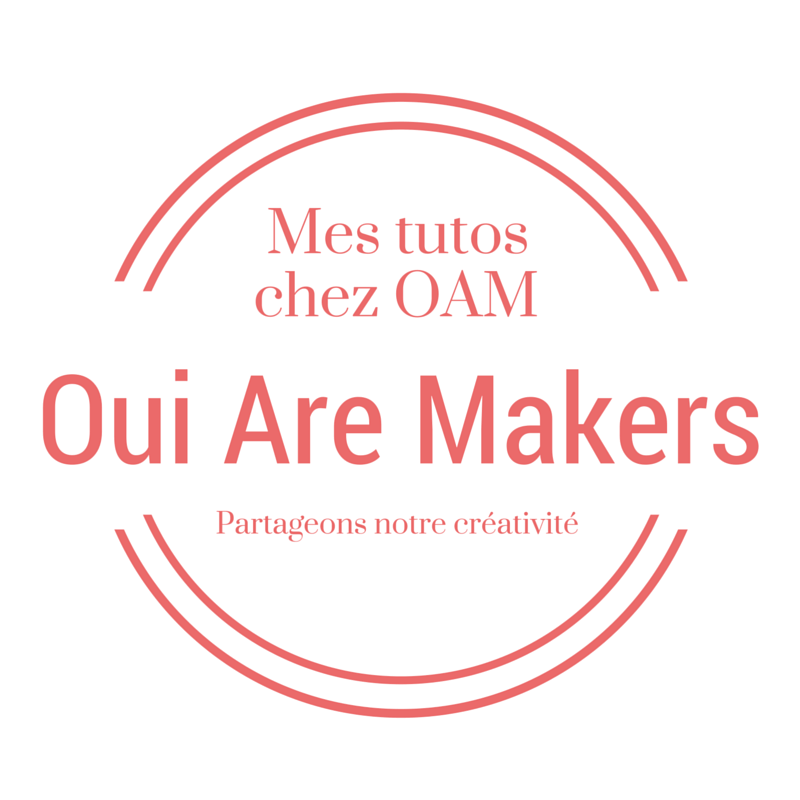 The pages should all be the same size, that of your final book (24 x 17cm). 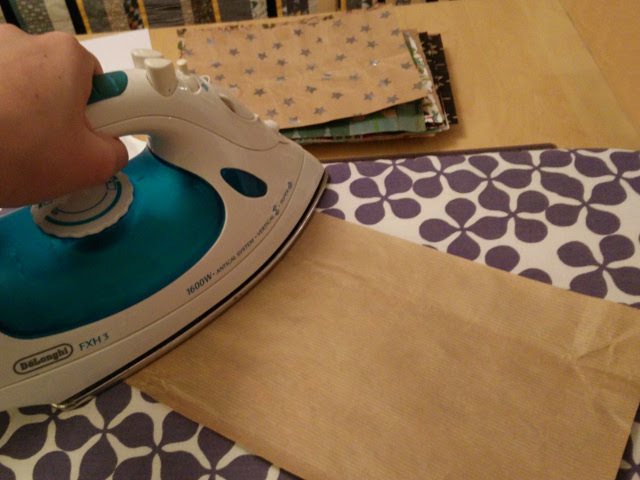 Iron any pages that are very crumpled or rolled up at a low temperature. Once you have finished this, pile up all of your pages between your cover in the correct order and orientation, ready to be bound. Make a template the size of your book, and measure where you want to pierce your holes. I made 5 holes, evenly spaced, and 2cm from the edge of the book. 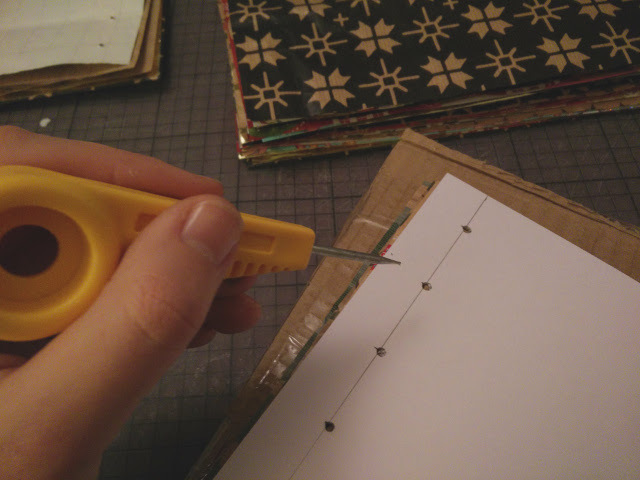 Pierce holes in all of your pages with an awl. 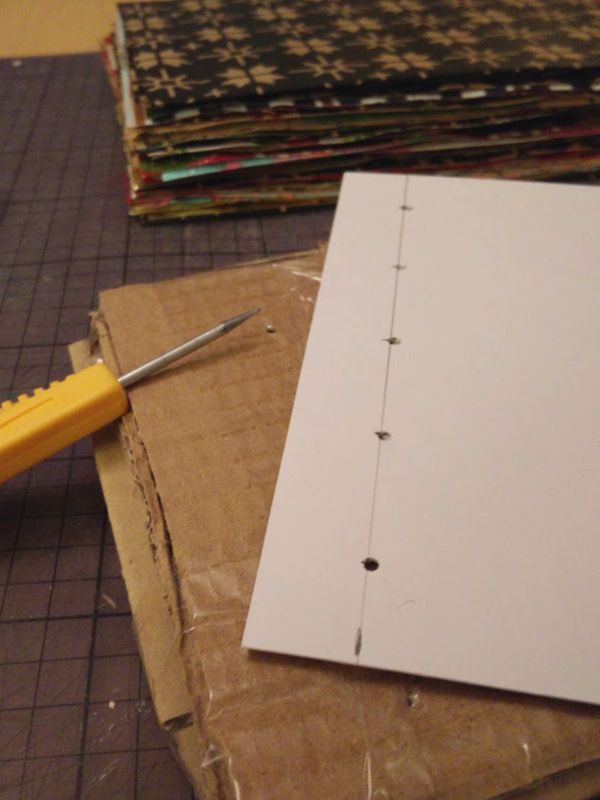 Pierce just a few pages at a time, and use your template to make sure all the holes line up. 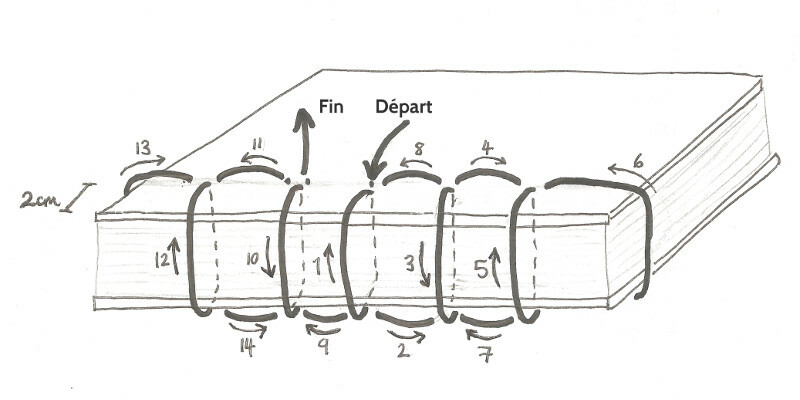 To measure the string, wrap it around the part of the notebook you are going to bind 6 times. Start sewing in the middle, leaving about 10-15cm of string. 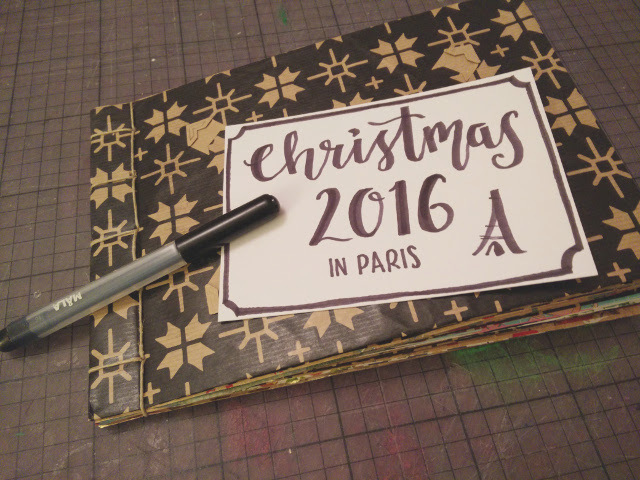 Start by moving towards the bottom of the notebook, passing the string around all of the pages at the spine at each hole. 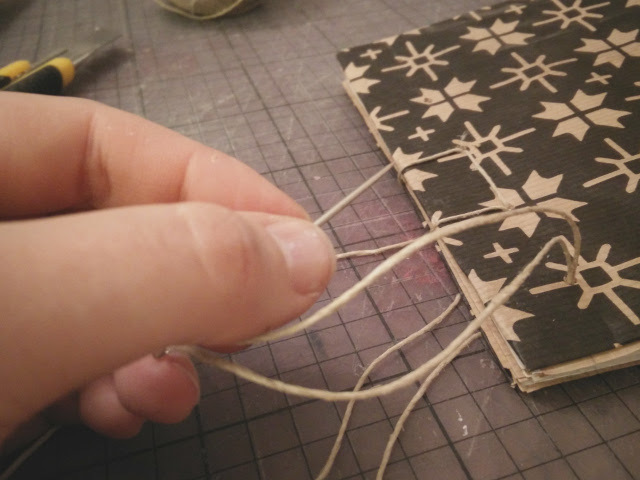 Once you reach the bottom, pass the string around all the pages at the bottom of the notebook too, and then sew back towards the middle, passing by the previously unsewn sections. 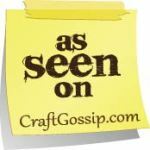 Sew the other half of the notebook in the same way. Once you have finished, tie a small knot. To finish you can either thread the excess string inside the notebook and cut it off, leave a pretty bow on the front of the notebook, or leave a long string to close the notebook with. And that’s it! 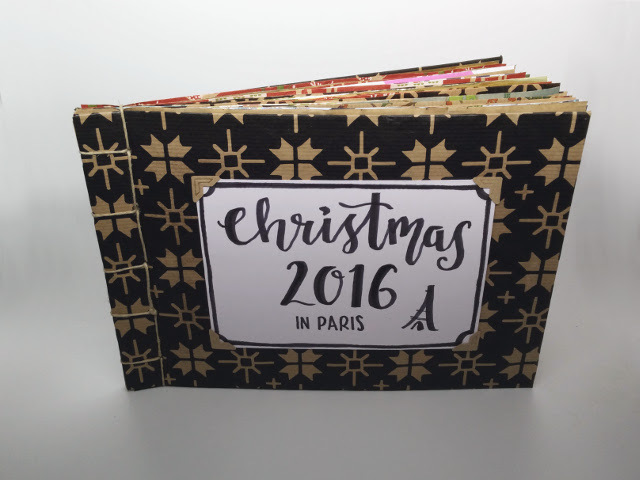 You can add a title or other decoration to the front of your Christmas photo album made from recycled wrapping paper, and then all you need to do is fill it with photos.